The community is the standard unit of analysis in ecology because through it both physical and biological aspects of the ecosystem can be determined. It offers the same potential in paleoecology. 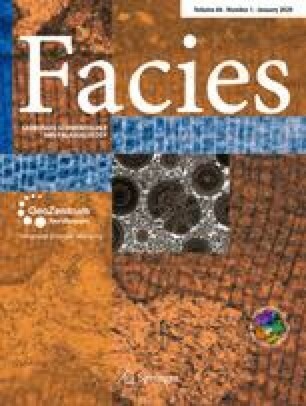 The communities of the upper Triassic reefs are analyzed from the literature and our own field work in order to determine their characteristics and to assess their usefulness. Six communities are recognized on the basis of R-mode cluster analysis of the do minant frame-builders in Rötelwand reef and from descriptions and our observations in other reefs. TheThecosmilia or High-growing coral, the Hydrozoan-tabulozoan and the Sponge communities are most widespread. The High-growingAstraemorpha, Low-growing coral andSolenopora communities are less common. Each community is characterized by a few dominant taxa and a larger number of associated taxa. The fidelity of the dominant taxa to their community is generally high; the fidelity of many of the associated taxa are typically lower and these taxa occur in a number of communities. Consequently, there is considerable overlap in composition between stands of different communities. In addition, the communities typically occur in patches only a few meters in diameter, and particularly in the Hydrozoan-tabulozoan community, the composition may differ considerably between adjacent patches. Differences in diversity between the communities are explained in several ways. Parameter of the physical environment can be correlated with diversity. Competition between members of the community probably had a strong effect on community composition and diversity. Different geologic longevity of the communities, which may have led to differences in community evolution and niche structure does not seem to be an important factor. Succession is poorly documented in these reef communities, either in encrustation sequences or in the development of individual reef patches. Community replacement, well developed only at Rötelwand, is assumed to reflect variations in water depth. The communities within several reefs are not sharply delimited geographically but have broad and overlapping distributions. The reef patches were widely and apparently randomly scattered in the reef tract, reflecting a generally uniform environment there. The depositional surface was not deeper than perhaps 10 m. The constraints on water depth are that it was shallow enough for the depositional surface to be within the photic zone for the growth of abundant algae, and above wave base for the production and multiple reworking of biogenic debris, but deep enough for a uniform environment with low gradients to be maintained across the reef tract. The reef patches did not have the capability to build up to sea level nor to construct a platform-edge reef dividing sharply reef and fore-reef tracts. The dominant organisms in the reef patches did not have the ability to construct wave-resistant framework. Consequently, these reefs do not fit the definition of ecologic reefs but do correspond to stratigraphic reefs.